It has been proven that a proper in-depth safety program can reduce accidents and risks in. 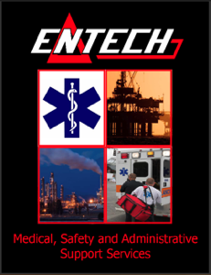 Entech can provide your work site with specially trained safety technicians or medic/safety technicians to assist you in implementing your safety program. The mission of Entech is to provide the best-designed and managed worksite safety, medical and clerk/dispatcher program available. We are committed to creating and maintaining a proactive, high value, and cost effective safety process.